A victorious Bob Stefanowski preparing to make his address to supporters. 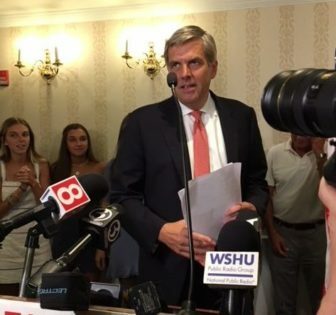 Bob Stefanowski won the five-way Republican primary for governor Tuesday night after ignoring Connecticut’s GOP establishment, opting out of the state’s public-financing program and repeating one outlandish campaign promise like a daily affirmation: He will “rip costs” from state government and make its income tax disappear over eight years. “I have a plan, I have a focus and I have an interest in putting Connecticut’s families first, not the special interests in Hartford. Those days are over,” Stefanowski said while accepting the nomination at a beachfront hotel in his hometown of Madison. Unofficial results showed Stefanowski with nearly 30 percent of the vote. His closest competitor was Danbury Mayor Mark D. Boughton, the party-endorsed candidate making his third try for the GOP nomination. Boughton, who won 21 percent of the vote, conceded at 10:39 p.m., promising to support the ticket. “Certainly as a Republican, I’ll stand tall with our ticket and make sure that our folks get elected and re-elected this fall, because at the end it’s about the team,” Boughton said. Hedge-fund founder David Stemerman and former Trumbull First Selectman Timothy Herbst vied for third, each with about 18 percent, with tech entrepreneur Steve Obsitnik of Westport out of the running early at 13 percent. Herbst conceded to supporters at 10:20 p.m. that he would not be leading the party in the fall. The turnout was 32 percent, according to the secretary of the state’s unofficial results. Stefanowski’s running mate will be Joe Markley, a conservative state senator who won nearly 50 percent of the vote in a three-way primary for lieutenant governor with New Britain Mayor Erin Stewart and Darien First Selectman Jayme Stevenson. Republicans chose Susan Hatfield for attorney general, Thad Gray for treasurer and Kurt Miller for comptroller. Youth was not served in the GOP primary: Herbst, Stewart and Art Linares, who lost the primary for treasurer, all are in their 30s. Stefanowski, 56, a former CEO of a global payday loan company whose disinterest in politics was measured in his failure to vote for 16 years, not bothering to choose in 2016 between Donald J. Trump and Hillary Clinton, had to overcome skepticism over his income-tax promise, spotty voting records and an unexplained nine-month dalliance as a Democrat that ended only a year ago. 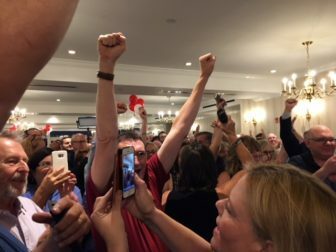 His victory could change gubernatorial politics in two ways: If elected in November, he would be the first governor to bypass the convention system in Connecticut, a hidebound state when it comes to ballot access; and Stefanowski’s allies emulated presidential politics, helping him with a free-spending super PAC that collected $730,000 from one donor. David Stemerman speaking to his supporters Tuesday night. Despite not voting for Trump, Stefanowski offered himself to the GOP base as a fan of an unconventional president who won office with no elective experience. Democrats were happy to associate him with the president. Early Tuesday, Stefanowski, a corporate expatriate in London for a decade working for GE, UBS Investment Bank and, finally, DFC Global, was upbeat taking his 88-year-old father to vote in North Haven, where he grew up and attended public schools. Stefanowski was one of two wealthy businessmen who blazed an untested path to the primary. He and Stemerman petitioned their way on the ballot, and both opted out of the Citizens’ Election Program, the state’s voluntary system of publicly financing campaigns. Stemerman was upbeat in defeat. Bob Stefanowski’s supporters celebrate as Mark Boughton concedes Tuesday night. Boughton, Herbst and Obsitnik accepted $1.35 million in public funds. With the rules limiting them to $250,000 in private funds, raised in increments of no more than $100, the trio had budgets of about $1.6 million. Stemerman spent at least $6.2 million, nearly all of it from the personal fortune he amassed as the founder of Conatus Capital. Stefanowski spent $2.9 million, but was helped by a super PAC that backed him with another $1.2 million in independent expenditures. Stefanowski could be challenged to unite a party whose electorate split five ways. Boughton, Herbst and Stemerman quickly promised to back the winner, but their supporters might take more time. Randy Blair, a supporter of Herbst from Stamford, said he could not support Stefanowski, whom he called “a fraud and a coward,” the latter insult a reference to Stefanowski leaving a press conference last week without answering a single question. The five Republicans on the ballot Tuesday were semifinalists in a game of attrition that began last year with more than a dozen candidates who impressed the party as capable of raising the funds necessary for a credible statewide campaign. At the polls, some voters arrived undecided. Bailey Tuthill, holding his sleepy four-year-old son, Edwin, was happy to encounter Herbst outside the Grove J. Tuttle Elementary School in East Haven, a community that favoredTrump in 2016. He said he was trying to decide between Herbst and Stefanowski. “So, how do we keep companies here?” Tuthill asked Herbst. 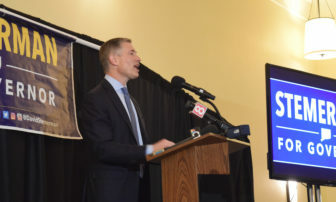 Herbst talked rapidly about a friendly stance towards business, his pledge not to increase taxes and his appetite for attacking unfunded pension liabilities that are destabilizing Connecticut’s finances. Tuthill said Herbst had his vote. 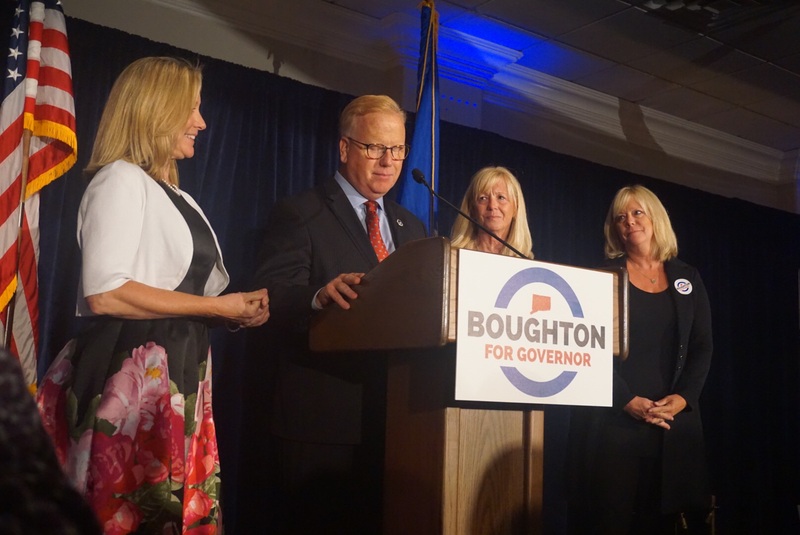 Mark Boughton’s hopes to be the GOP nominee for governor ended Tuesday night. But the exchange seemed emblematic of a campaign in which no obvious frontrunner emerged. 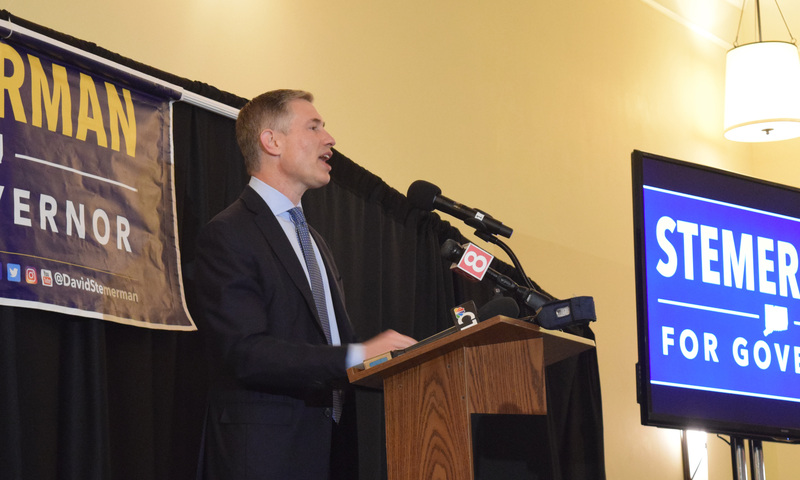 Stefanowski, the first to go on television with ads stressing his outsider status and insistence the income tax could be repealed, was the early consensus leader, according to political operatives with access to tracking polls. His early rise above the pack also made him an early target, first by Herbst and Stemerman, later by the entire field. As the primary approached, political operatives said they saw everyone but Obsitnik as still viable. The biggest question Tuesday morning was who would turn out. Herbst made a strong play for cultural conservatives and gun owners, winning the endorsements of the Family Institute of Connecticut and the state’s largest association of gun owners, the Connecticut Citizens Defense League. Stefanowski countered with an endorsement by Peter Lumaj, a conservative favorite of Second Amendment advocates who had failed to qualify for the primary. Stefanowski’s campaign, which sent targeted mail to gun owners, thought it was successful in winning at least some of the gun vote. On Tuesday night, he quickly turned the focus back to his claim that Connecticut is ready for a business leader, even one brand new to politics. Boughton, who had delicate brain surgery last summer to remove a non-cancerous tumor and suffered a seizure while campaigning in March, also was philosophical, noting his victory over his health problems. Tess Hamilton-Ward contributed to this story.